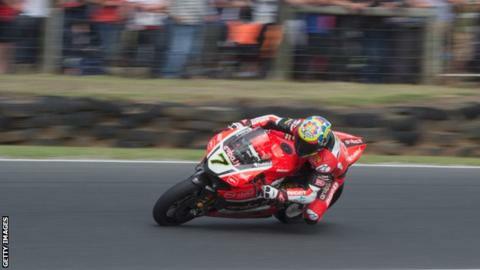 Welshman Chaz Davies moved into second place in the World Superbike championship after completing a double in Aragon. Davies, 29, finished ahead of Englishman Tom Sykes and Northern Ireland's Jonathan Rea. The Kawasaki pair had a compelling duel for second place with Ducati's Davies dominating the race. The Welshman is 26 points behind series leader Rea who won the opening three races of three races of the season. Sykes is three points behind Davies, who claimed his 11th victory in Superbikes. Davies' win in the opening race of the weekend ended Kawasaki's winning start to the season. Defending champion Rea now has 131 points, with Davies on 105 and Sykes on 102.